And so it begins……. . . Being willing to buy a light that’s not high CRI is different from preferring it. Given the option, I’d much rather this light be one I can use for everything I might need to do that day which includes pulling it out to help gauge the color of something (clothing/fabric or other colored products, for instance), like I sometimes do with the d4 219c. If you’ve ever bought clothes under poor quality florescent lighting, and then when you look at them outside they are a different color, you know this can be frustrating. If not, look up the old “The Dress” controversy; the type of light source the viewer thought was being used determined what colors they thought the actual dress contained. My use case does not include trying to look for things further from me than a high brightness can reveal, but rather using a floody beam to see the entirety of a nearby object, instead of only a small spot on it. Indeed, I could see down a path with trees on either side for some considerable distance using the d4 219c turbo, although of course that’s not usable for a long time in warm weather. I only used it for ~30s or so. Still, the standardized throw of that would have been around 160m at the time (ga cells and a lee minus green filter). In the fw3a, the throw of a samsung comes up as about 155m assuming 2cd/lm and the xpl is 243m or so. Personally I like the d4 219c and don’t particularly want something throwy, so if the fw3a was as similar to my d4 as it seems, I’d be very happy. The choice seems to come down to this: do you want your small, elegant light to produce a beam which is rather wide but is definitely soft and as aesthetically pleasing as befits the design, or do you want to tack on another few dollars to fit a CREE in order to chase cd, despite small multi emitter lights being entirely wrong for that? No, multi-emitter lights are not wrong for throw. Being right for throw, for me, is maximizing cd/volume and cd/weight. Beam intensity is roughtly intensity of LED multipled by reflector area / active TIR area. 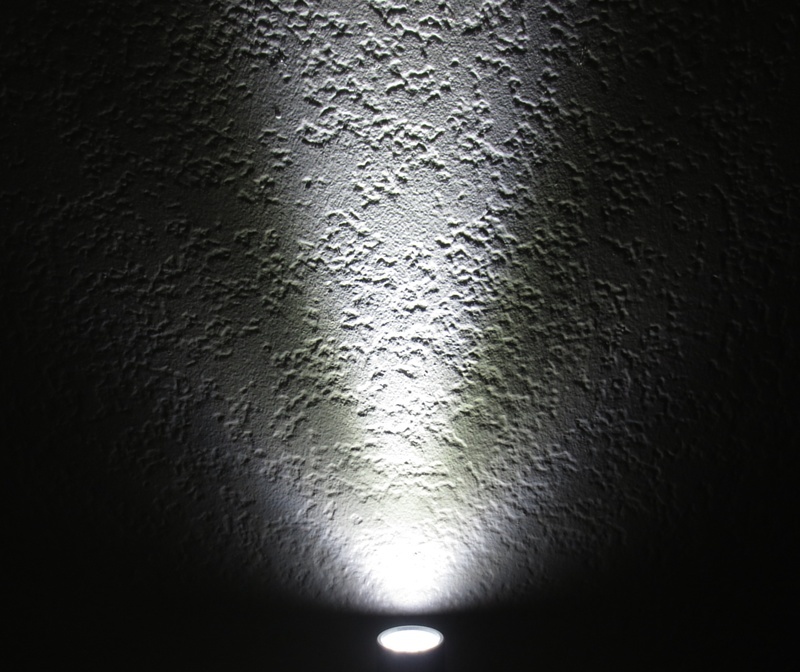 Multi-emitter lights add some dead area on the front of the light, so they need to have wider heads for the same effect. So of we compare 2 lights, one with 4 mm² emitter and another with four 1 mm² emitters and same reflector area, they’ll have similar intensity and similar output. The former will be longer, the latter thicker. The latter will be lighter and have smaller volume. Due to smaller size, it will cool worse for smaller sustained performance. It will have a weirder beam. Overall….I think that both approaches make sense. As shown above, the only downside to the XPL HI is that it costs a tiny bit more. It is equal to or better than the others in every other category… especially heat management. In a light this small, heat management is a big deal & should not be ignored. As TK mentioned a few posts back…. there is much more to consider than CRI. Consistent beam is another consideration. The XPL HI is the best in that category also. The XPL HI is by far the best ‘all around’ choice for this light. It is not just a matter of throw vs. flood. It is a matter of the best choice for ‘all around’ use. Nope. LH351D is more efficient and more powerful. Much more efficient. As long as you compare units with the same CRI which TK didn’t do. ….especially heat management. In a light this small, heat management is a big deal & should not be ignored. As to heat management – this is a matter of opinion. Some want flashier with more output for shorter time, some want cooler that shine for longer. There won’t be much difference though. Vf is pretty similar. 2 seconds? Maukka praises LH351D for tint consistency. Totally agree with you here. But the XP-G2 deserves some elderly respect :HAT:. Still love that emiter for the lower heat, consistent tint and great balanced beam. Totally agree with you here. But the XP-G2 deserves some elderly respect . Still love that emiter for the lower heat, consistent tint and great balanced beam. Yep, your right. That would be my next choice. EDIT: We are on the same page about the XP-G3 too. Huh? Since when is the XP-L Hi considered to have a consistent beam in a Carclo optic? The beam is so ugly that Hank had to design a special rotated pads ledboard for it to make its pointy hotspot half acceptable. The small Carclo triple and quad board give the smoothest beam with small die leds, the XP-E(2) looks wonderful through them, and XP-G size leds look very ok too. The XP-L(hi) has a too big die for this optic, it gets less efficient and the beam is ugly. Strange enough, the LH351D has an even bigger die but still looks good, but I doubt that the optic is very efficient with them. (...) As shown above, the _only_ downside to the XPL HI is that it costs a _tiny_ bit more. It is equal to or better than the others in every other category... especially heat management. In a light this small, heat management is a big deal & should not be ignored. As TK mentioned a few posts back.... _there is much more to consider than CRI_. Consistent beam is another consideration. The XPL HI is the best in that category also. The XPL HI is by far the best _*'all around'*_ choice for this light. It is not just a matter of throw vs. flood. It is a matter of the best choice for _*'all around'*_ use. The ONLY downside? A TINY bit? It's a solid 120% of the starting price; in fact it's more than the d4 now costs. It may be only $6, but it's still a big percentage. And what about color rendering? 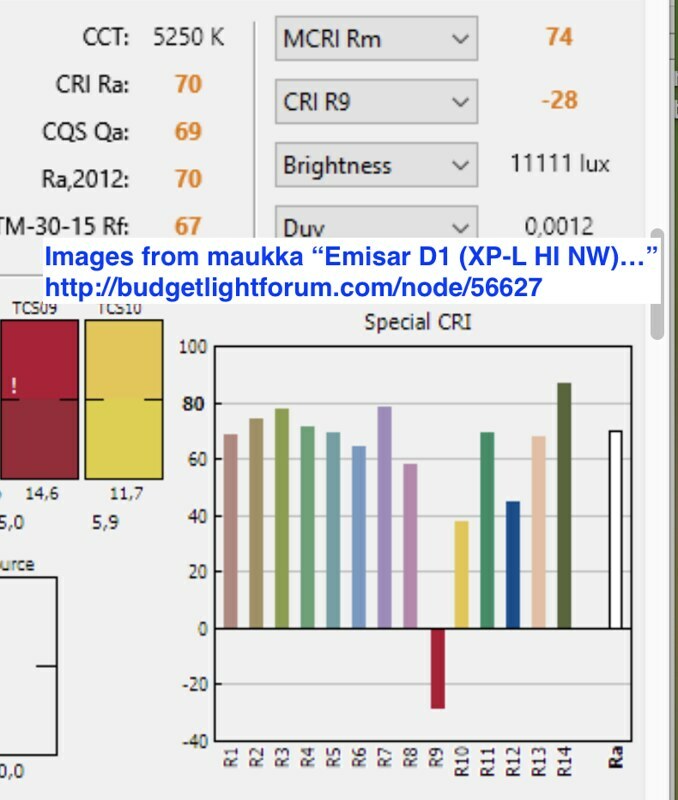 Not only does the XPL have a mere 70+ cri, the lh351d's test (http://budgetlightforum.com/comment/1303707#comment-1303707) as having an even higher r9 value (79) than the regular 219c (rated at 50), to say nothing of the xpl which would be something like -28 (that's negative!). Maukka also says the lh351d would get about 2.25cd/lm in a triple clear tir, which means my previous comment was actually underestimating it. I should expect then more like 165m, or more than my personal copy of the d4 219c (would still be mildly less than other people's, but not unimpressive for 3 emitters vs 4). The other thing is that these samsung ones would be very efficient indeed, and make little heat, because the Vf is higher and the flux is pretty comparable. That's with about 9% less lumens than xpl, but equal lumens to the xp-g3 we all know and despise. I believe they may even make less heat than the xpl's given the Vf and flux difference, but I haven't tested that. They have a VERY consistent beam according to the beamshots I've seen; please refer to maukka's tests for this as well. Inconsistent beams are mostly a cree thing :P.
Just not very impressive, right? “I’ve done some further run testing. Also modded mine with replacing the CW XP-G2’s with XP-G3 S5 5000K’s. I got a slight bump in output, possible slight drop in amps drawn (not sure of this). Actually the CW stock LED’s had a pretty decent tint – nice white, no blue at all. The XP-G3’s look really good in this light – no yellow, or any rings, etc. Tint is as good as the good XP-G2 CW stock LED’s. I’m happy with the upgrade, though no big impact. That sounds good to me. I personally want my EDC FW3A to have Throw & Flood. I don’t know if it’ll be possible to get Lumintop to make more than one flavor, but if so, it sounds like it’d be a good idea to do a throwy(ish) flavor with XP-L HI and an extra-floody flavor with LH351D. I’ll let the poll run first though, along with a poll about color temperature. There are several communities interested now, and hopefully it’ll help to have more quantified preference data. I suppose there is no way we would know how much less throwy the Samsungs would be? Sorry for the off topic comment, but are those samsung LEDs available on triple boards anywhere? Yeah I’m also confused as to why the XP-L HI is mentioned as having a smooth beam when it isn’t really meant for these optics and anything I’ve seen didn’t look good. 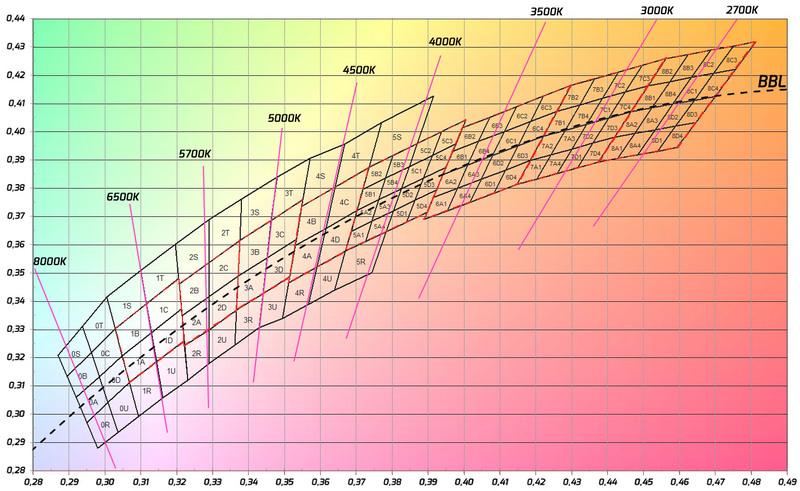 As Agro noted, LH351D 70 CRI would probably have the most lumens, similar to XP-L2. Probably also less heat than the 90 CRI version. Should that be an option? Usually flood and CRI preferences tend to cluster together, so I only listed the high CRI option. Using a Carclo 10507 optic, even XP-G2 has kind of an ugly beam with obvious artifacts and rainbow effects. The 10511 optic mostly fixes that, and it can be reasonably throwy, especially after polishing the top surface a bit. However, it’ll likely still display a little bit of rainbow on XP-G3, and twelve very faint corona petals with some emitters… even 219b. Nothing like the original D4’s pinwheel pattern though. It looks like the range here is very approximately 2 to 4 cd / lm. Maybe 1.5 to 4.5. The entire range is toward the floody end of the spectrum, but LH351D is the floodiest of the bunch and XP-L HI is the throwiest. Basically, at a distance of ~5 meters or more, the Samsung emitter would need to put out about twice as many lumens to light up objects as well as the Cree emitter. Some people seem perfectly happy with negative R9, that makes Red look Brown. The poll will help sort out which group is larger, and for the others, an LED swap should be an option. Because I’ve tried a variety of emitters in Carclo triple optics, and have found XP-L HI plus 10511 to be a good combination. Its domeless design mostly eliminates any rainbow effects. It has a significantly smoother beam than 219b + 10507, for example, though not quite as smooth as 219b + 10511. To completely eliminate artifacts though, a floodier optic is needed — like 10508 or 10509. Thanks, TK. That makes it very easy to understand. I was waffling, but now, I know I’d prefer XPL-HI’s. At the time I said this the XPL HI was the only one with 5 stars in the “Beam” column. Now it seems to have dropped to 4. 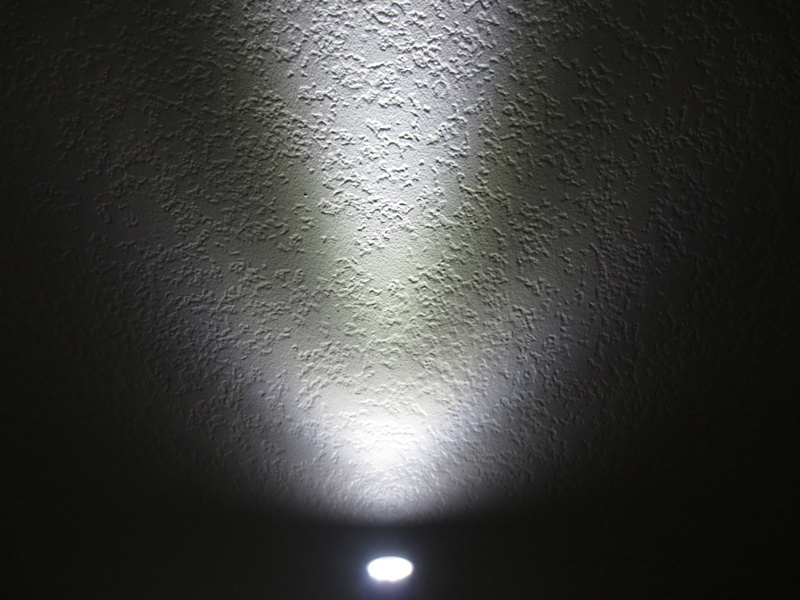 OTOH, Samsung lights up a wider area, and reviews for it have been very positive. It’d be a great option indoors. I agree, it sounds intriguing, which was causing the waffling. I think it may make for too much of an indoor use light though, and be a bit underwhelming as an indoor/outdoor edc. (…) As shown above, the only downside to the XPL HI is that it costs a tiny bit more. It is equal to or better than the others in every other category… especially heat management. In a light this small, heat management is a big deal & should not be ignored. As TK mentioned a few posts back…. there is much more to consider than CRI. Consistent beam is another consideration. The XPL HI is the best in that category also. The XPL HI is by far the best ‘all around’_ choice for this light. It is not just a matter of throw vs. flood. It is a matter of the best choice for _’all around’ use. The ONLY downside? A TINY bit? It’s a solid 120% of the starting price; in fact it’s more than the d4 now costs. It may be only $6, but it’s still a big percentage. And what about color rendering? 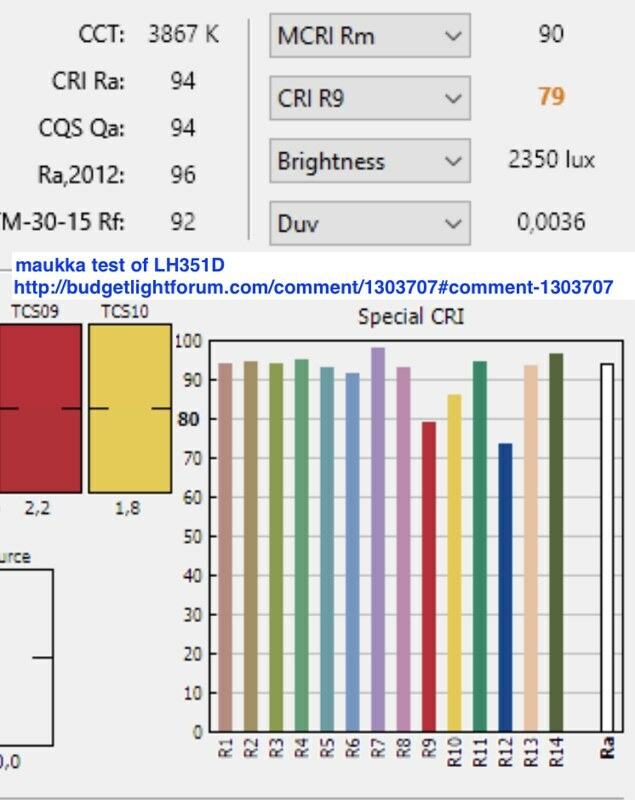 Not only does the XPL have a mere 70+ cri, the lh351d’s test (http://budgetlightforum.com/comment/1303707#comment-1303707) as having an even higher r9 value (79) than the regular 219c (rated at 50), to say nothing of the xpl which would be something like -28 (that’s negative!). Maukka also says the lh351d would get about 2.25cd/lm in a triple clear tir, which means my previous comment was actually underestimating it. I should expect then more like 165m, or more than my personal copy of the d4 219c (would still be mildly less than other people’s, but not unimpressive for 3 emitters vs 4). The other thing is that these samsung ones would be very efficient indeed, and make little heat, because the Vf is higher and the flux is pretty comparable. That’s with about 9% less lumens than xpl, but equal lumens to the xp-g3 we all know and despise. I believe they may even make less heat than the xpl’s given the Vf and flux difference, but I haven’t tested that. They have a VERY consistent beam according to the beamshots I’ve seen; please refer to maukka’s tests for this as well. Inconsistent beams are mostly a cree thing :P.
Yep… the ONLY downside to me. And $6 is TINY in the big scheme of things, to me anyway; to get what I prefer. And CRI means just about ZERO to me in this discussion. XPL HI is my preference ATM, I like it. If it is not yours that is fine with me. I agree, it sounds intriguing, which was causing the waffling. I think it (LH351D) may make for too much of an indoor use light though, and be a bit underwhelming as an indoor/outdoor edc. Agreed. Not a good choice for best “all around”….. for my money anyway. I am sold on the XPL HI also cabfrank. I care about the $6 because I’m not just buying one of these, and it is a 20% difference in price. I’ll definitely be doing some emitter swaps in those no matter what the production emitter is. I care quite a bit about CRI as well. It’s not the kind of difference that smacks you in the face like the XP-G3 rainbow or a few thousand K difference in CCT, but being used to it, I notice when it’s absent. It’s to the point that I’m rarely tempted to use my one light with an MT-G2 because its poor rendering of reds and browns annoys me. Object recognition is slower. My perception of fatigue is higher. My first choice will be the 219C. It works well in FET triples even if it does throttle a bit sooner than the other options. My second choice will be the LH351D, because it’s the only other 90 CRI option. I don’t think giving up throw for heat/output relative to the 219C the right trade here, but it is worth it to me to gain CRI over the Cree options. Also, I wouldn’t mind having a bunch of them after swapping a two or three of the lights for 219Cs). Understood. I am FAR from having a lot of money. Very far.